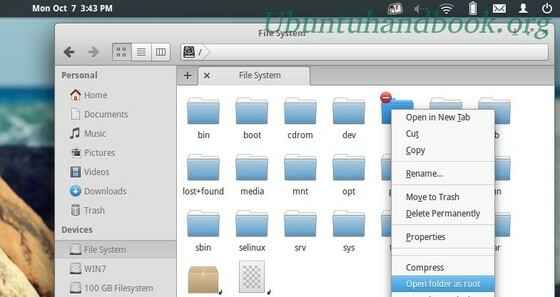 This simple tutorial will show you how to add ‘Open as Administrator’ or ‘Open as root’ to Pantheon Context menu in Elementary OS Luna. So that you can easily open system files or folders with super user privilege through the default Pantheon file browser. Before getting started, search for and install gksu from Software Center. It is a Gtk+ frontend allows graphical programs to ask a user’s password to run another program as root / administrator. It’s a little different to Ubuntu Nautilus. Because I don’t know how to use if conditional statements in ‘.contractor’ files, so I divided this into two parts: Open files as root and Open folders as root. 2. Copy and paste below lines into the file and save it. This will add an option “Open file as root” to Pantheon context menu, which open text files as root user with Scratch Text Editor (the default editor for eOS). This adds the option ‘Open folder as root’ to context menu, which open folders as root privilege. Remember, you need a restart to get things done. Enjoy! You might want to add this to your list of items for the right click menu. How to add “delete permanetly” option to File’s context menu. I could not find this anywhere, so created it. If there is a better way, let me know.